The Cardamom mountains sound like a magical place, the largest tract of evergreen forest in asia. I wonder what other unknown treasures are in those mountains...With so many endangered & threatened species, it sounds like an area that should be protected & tread upon lightly. Thanks for the post! They find new species of animal and also destroys thousands of other species. Thanks for the post. I like geckos. Hope this new discovery does NOT lead to its extinction. 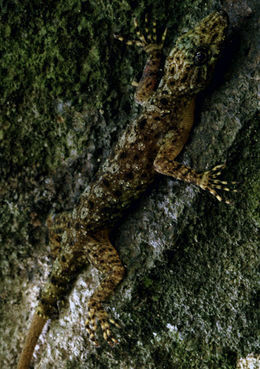 They have a relatively ancient body plan characterised by a broad flattened head, large forward and upward directed eyes, flattened body, long widely splayed limbs, and long inflected digits that help them to climb trees and rock faces and seek refuge within crevices. This is the second species of the Cnemaspis genus to be found in Cambodia. It is endemic to the Cardamom Mountains, meaning it lives nowhere else on Earth. Well you can see why it was able to hide from man so long.. as much as I am glad to see it I am sad it has been seen.